Spot silver continued to move higher once again yesterday ending the silver trading session as a wide spread up candle which finally held above our short term target of $20 per ounce (hurrah!!). 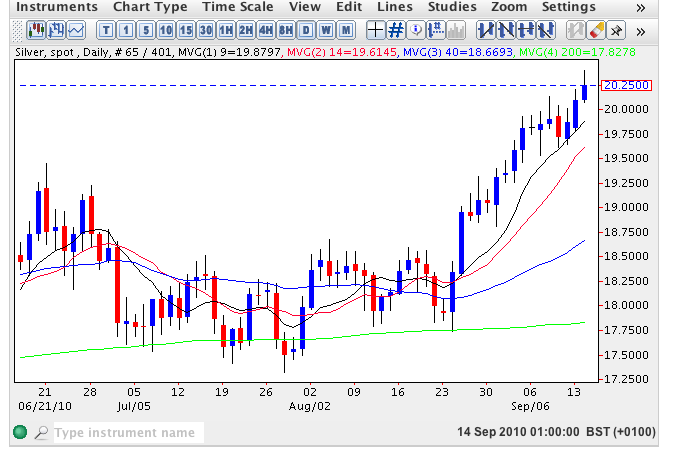 This move higher was fully supported by the 9 day moving average which has continued to extend its excellent support to the move and coupled with the 14 and 40 day moving averages which are both pointing sharply higher the outlook for silver bulls is increasingly encouraging. This positive sentiment has continued in this morning’s early trading, which is trading at $20.29 per ounce at time of writing, and with the current strong performance from gold silver looks set to re-test the high of March 2008 where the metal achieved a price of $21.38 per ounce. The monthly chart also confirms this picture with excellent support from the 9 and 14 month moving averages with no signals at present to suggest any pullback is likely in the short term.